image size 18½" x 11"
Resplendent in the morning sunrise, the Avro Lancaster sits majestically. One could almost believe it is a wild animal sniffing the air, secure in its natural habitat. Watching the scene, the total silence is occasionally broken by the chink of a dropped spanner, a young voice expresses a solved problem, fresh human silhouettes materialise through the mist from behind a massive wheel and we quickly realise that these people are not pilots or navigators. They are armourers, engineers and electricians confronting tasks and problems that demand from every individual tradesman, a duty to fulfil a common purpose, to get the aircraft ready for its next sortie that evening. 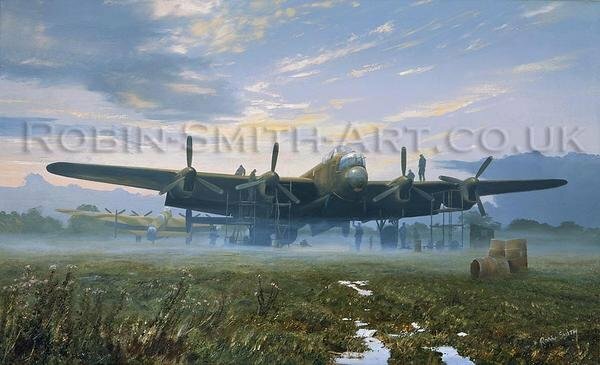 My painting depicts a typical scene, silhouetted against a damp misty sunrise, the Lancaster shows off its massive paddle blade props (so nicknamed "paddle Steamers") waiting for two more props to be aligned so the Matador bowser can be reversed in safely for re-fuelling. I have a great passion for atmospheric scenes and the misty morning was one of the most important elements of this painting. What a contrast between the still tranquil silence of the scenario depicted to the hell that was soon to challenge the courage of every member of the crew in a matter of hours to come. To the memory and appreciation of the all too often forgotten ground crew, often working to full capacity in horrendous and insecure conditions and the bravery of all seven members of the aircrew, I owe my freedom and dedicate this print.